The following is a message from Principal Suzanne Fortier on the sudden passing of H. Arnold Steinberg, Chancellor Emeritus of McGill. It is with great sadness that I inform you of the passing of H. Arnold Steinberg, McGill Chancellor Emeritus. Mr. Steinberg died suddenly this morning in Montreal. He was 82 years old. On behalf of the McGill community, I send my deepest condolences to his wife, Professor emerita Blema Steinberg, their three children, Margot, Donna and Adam, and their families. Arnold Steinberg believed in the transformative power of education. So, too, was he a tireless champion for improving the quality of health care. For more than half a century, Canadians of all stations benefited enormously from his dedication and vision. A lifelong Montrealer, Arnold graduated from McGill with a Bachelor of Commerce in 1954. His education was only the beginning of his deep relationship to McGill University. As a senior executive of the Steinberg grocery chain, he partnered with the Montreal Children’s Hospital to campaign for the addition of Vitamin D to milk, a bold act that effectively eliminated childhood rickets from the Quebec population. He would go on to serve as Chairman of the Board of Governors of the McGill University-Montreal Children’s Hospital Research Institute for 19 years, and was a member of the University’s Board of Governors for 10 years. In 2006, Arnold and Blema’s generosity created what is now called the Steinberg Centre for Simulation and Interactive Learning, the first medical treatment and training centre of its kind in Canada. Earlier this year, the Steinbergs expanded their vision for the centre, integrating education, patient and community engagement, and research. 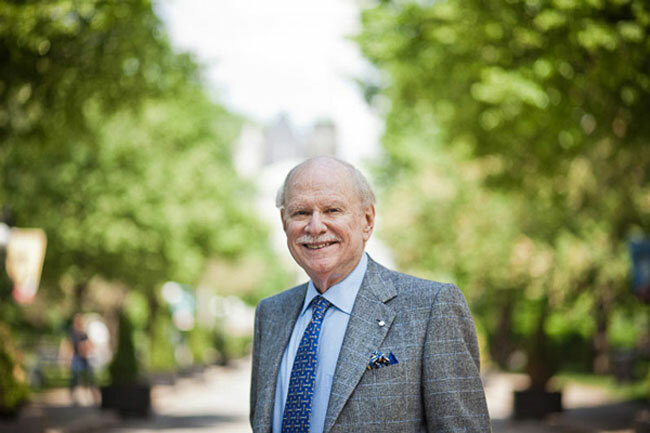 Although it is impossible to single out one achievement during such a long lifetime of dedication and service, Arnold’s five-year tenure as Chancellor of McGill University was extraordinary. As he did throughout his life, he brought to the job a boundless curiosity and focused intelligence. He was decisive when he needed to be, kind and humble always. All of us who have had the honour and privilege to know and work with Arnold have lost a dear and loyal friend. In the coming days, the McGill Reporter will have more remembrances of the life and achievements of this exceptional McGillian, Montrealer and Canadian. Arnold Steinberg will be dearly missed, yet his positive impact will live on. (Editor’s Note:) Learn more about the tribute project honouring H. Arnold Steinberg. Mr Steinberg will always be remembered as a great supporter of McGill Athletics and Recreation. I was surprised and saddened to learn this over the weekend. Just three weeks ago, while attending the scientific symposium for the 50th anniversary of CEA, I believe it was none other than Mr. Arnold Steinberg sitting a few seats to my right. By the time I noticed him, he was getting up to go somewhere. I thought he would return, so I could greet and introduce myself to the man occasionally described as the mysterious Chancellor during my early years at McGill. I never saw him again. My sincere condolences to his family, friends, and neighbors — as well as all those who knew him inside and outside of the McGill community. Rest in peace, sir.